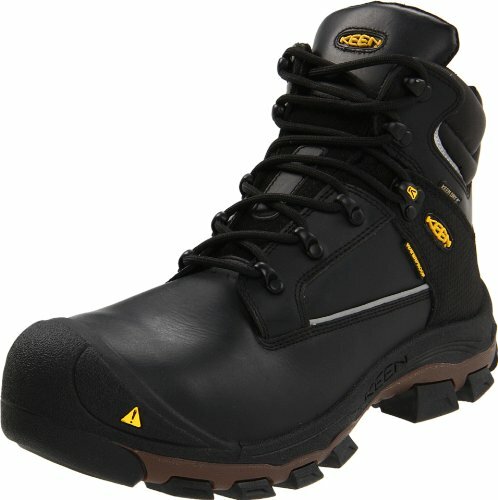 < img> Keen has a nice selection of work boots including the Utility Men’s Portland PR 6” Aluminum Toe Work Boot. This rugged boot is equipped with added features that would be ideal for a warehouse worker, contractor, or construction worker. To provide you with more information on these particular work boots, we are breaking it down into sections so you can better understand the features available in these boots, plus we will rate them on a scale from 1 to 10 for safety, price, and comfort. Lets read more about Keen Portland, the one listed as one of the best work boots in this year! Several comfort features are incorporated into these work boots, they include a removable meta atomical dual-density EVA foot bed, Dry-Lex footwear lining with hydrophilic and hydrophobic 2-zone comfort technology that keeps moisture out, plus breathes and provides heat release and odor control. Also, these boots have a padded collar for additional cushioning around the ankle. These boots are equipped with an aluminum safety toe that meets ASTM safety standards with electrical hazard protection. In addition, the midsole is puncture-resistant, which is great for construction job sites. The outsole is both oil and slip resistant and features ample traction to grip various surfaces. The toe of these work boots is a lightweight aluminum safety toe that meets ASTM F2413-11safety standards with electrical hazard protection. They provide ample protection against compression and impact to keep your toes safe. Keen is a well-known brand name with an established reputation. They manufacture their footwear in Europe, Asia, and North America. The company itself is a supporter of protecting the environment and has incorporated the hybrid.care technology into their line of footwear. In addition, they have been involved in making quality shoes and boots since 2003. The outsoles are direct attach, which means they are the most comfortable attachment method but not the most durable. They do however hold up rather well in wet conditions even without treatment. Furthermore, the aluminum toe is highly durable and offers very good protection from impacts and compression. As mentioned previously, soles are direct attach and there have been some issues of detachment or wearing. Also, shoe laces have been known to break, however, that is an easy fix by replacing them. The footbed does not have much cushioning; therefore it is recommended to use an additional insole. Check out our reviews of the best insoles and inserts. These work boots are waterproof, they maintain very well in wet weather. 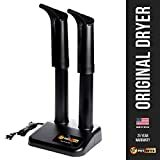 Furthermore, they are equipped with a Dry-Lex lining that keeps the moisture out and a Keen Dry waterproof, breathable membrane to assist in keeping your feet dry as well. Click to read more waterproof work boots. Though these work boots offer ample protection and are comfortable to wear for long periods, we would suggest they be used to work in warehouses, factories, and possible road construction jobs, or any field of work that doesn’t require you to subject them to hazardous surfaces or rugged terrain. They are slip resistant and oil resistant, which is ideal for concrete surfaces where the potential of slipping exists. Check out our best work shoes for standing on concrete.